I used to need new clothing items ALL the time. I hated being seen in the same item and heaven forbid, the same outfit, more than once per month. A huge variety was what I craved. But this new search for simplicity and now much smaller wardrobe has hit me with an epiphany and this blouse is the perfect visual illustration. I only crave variety when I'm not 100% happy with what I already own. Duh. Why on earth didn't I figure that out until now? I always thought I was the person who just wanted variety for creativity sake but I was really searching for the perfect items. When I have items that I love and even most importantly, feel good in, I have no problem wearing it often and even in the same ensembles. I feel fabulous in the blouse. Every.Single.Time. And I have worn it a lot since purchasing it -at least every 10 days. Both casually and at work. Doesn't bother me a bit that everyone I work with has seen it often. My drape front EF dresses are another example. Anyway, on to today's outfit. It's still crazy warm here for late September and I'm taking advantage of it by wearing a rather summery outfit. 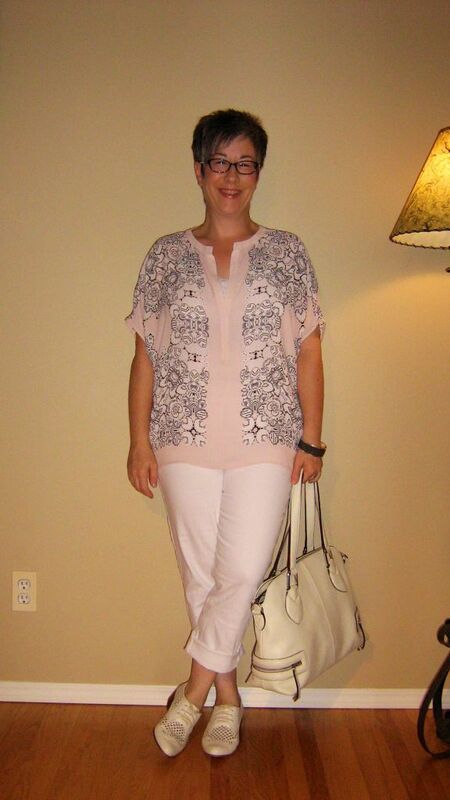 I've paired my drapey blush/white/black blouse with my rolled white slim leg BF jeans. As a nod to autumn, I chose my laser cut oxfords for footwear. 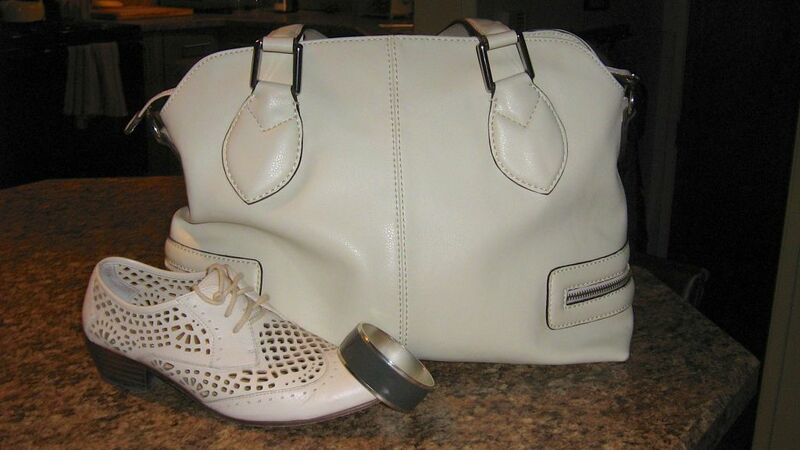 Accessories include my large cream handbag, grey/silver bangle and silver wedding ring, and black/white specs. Anybody else had a significant "aha" moment lately when it comes to your wardrobe? Comments on today's outfit? You look fabulous. You are right. That blouse is amazing. So are your purse and shoes. Well done. That's a fantastic observation Shannon! I wonder if I have the same *issue* ... Hmmm .... I too love wearing the items I love again and again. It surely isn't about craving for novelty ... May be just the perfect items. I would have to reiterate this at a later stage. I love this blouse on you as much as you do. With white .... It's just divine. YLF! That's a great observation, Shannon. I'll have to think about that in my own wardrobe. Well, you do look fantastic in it! I think I'm starting to realize the same thing about my wardrobe, Shannon. I love having variety, I really do, but there is a reason why somethings are reached for all the time, and others not so much, even though I *like* them. The workhorses are on another level -- not only are they loved, but they are also usually versatile and require very little thought to style. I have plenty of things in my closet that I like, but they require thought and planning to wear. I love this blouse on you, too, Shannon. Just divine, and enjoy wearing it on this last lick of summer day! OMG, now, that you have put it out here, I might have had exactly the same significant "aha" moment, for me. YLF of course, but I'm off to think about this deeper...It's quite shocking for me to have this revelation:-). Can you say what made the difference when you chose the blouse? Or did the love emerge after wearing it a few times? Was it a splurge? Is there something we can learn about this epiphany to guide finding more items like this? I, too, crave variety a lot less - rewearing outfits that I love once every two weeks or so makes me happy. I never thought it would be so. And it motivates me to keep my fall/winter wardrobe streamlined like my summer one became. Shannon, this outfit is just perfectly perfect! You look stylish and happy -- and who could ask for anything more? I realize that I was coming at it from a different angle from most who have replied. Most who are agreeing tended towards wardrobe maximalism in the past. And maybe even having quite a lot of duplicates or near duplicates. I'm coming at it from the opposite end -- I didn't even have a basic wardrobe. So maybe what I should say is that I enjoy having a moderate closet where all my basics are covered. I absolutely love to repeat items and entire outfits and do so a lot. I even did so a lot this past summer, when my wardrobe was the largest it has ever been. I guess I've never had a wardrobe big enough to allow me NOT to repeat. And that remains true. And is okay with me. Also, I edit out the stuff that I don't like wearing -- fast. I agree with Amiable that having one _____ that's just right eliminates the need for 3 versions. I'm aiming (slowly) to get there. Of course, I want some variety. One pair of jeans would not satisfy! But one black tee? Sure. If it is great in every way - fit, fabric, style. I'm good. I think you are onto something here! I've noticed with my own closet that once I find The Right One, the others tend to head for the out-pile since they are no longer worn. Maybe its NOT variety I crave...rather The Right One. And the others were simply holding spots until The Right One appeared. I've noticed that you gravitate to graphic black and white (or in this case black and pale) patterns, from the boldest possible to the most delicate tracery--and I think that's so smart, because they do wonderful things for you. This top looks like a dream to wear, and it has a very feminine prettiness within a very modern, minimal shape. Nice outfit, great bag! I, too, find myself craving quality, and willing to search for it these days. Yes - great epiphany for a beautiful blouse. But you also have found everything you need for this outfit, which works beautifully. While I have found some perfect pieces that I really want to wear, I still struggle to find partners for them. More strategic outfit planning. 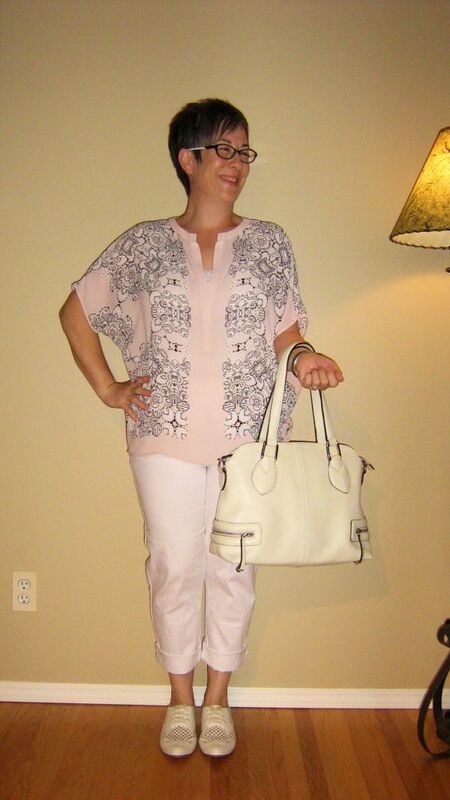 Were you thinking about what the blush blouse needed to go with it, or did you have these other pieces? You are singing my song! I am a happy outfit repeater when I love the item/outfit. I never felt the need to be different all the time. But I do/am still feeling the need to up that happiness factor and not settle for things that don't have it. My closet is improving but still holds quite a bit of blah! YES! The big question for me is how to identify in advance those kinds of items so you don't get stuck with a closet full of almosts. Love the blouse on you! Love the outfit, and I would each and every time I saw it. That blouse is always a stunner on you (totally wish I'd pulled the trigger on it!). Your epiphany is, like... epiphanizing for me too. I don't desire a minimal wardrobe by any means, but over the past two months I have been slowly headed to this realization myself (just hadn't actually gotten there yet). I think you've just saved me a LOT of hand-wringing time Shannon, thank you for sharing this with us. Now I've got a more concrete concept to mull over, and that should really help me with my now far more limited wardrobe budget. This blouse is stunning on you. The outfit is fantastic! I'm not where you are, yet. Yesterday I re-wore an outfit that felt fab and got a lot of positive response here on the forum, and I felt I was just falling back on it, and it didn't feel as fab as it felt before. I changed the shoes and jewelry just to have something different about it. Maybe I subconsciously felt I had on the second-string version of the outfit? I don't know. I sense I do crave variety. I don't know why, though. I had a similar realisation. I'd come to a point were I seemed to be constantly shopping for something; until I realised the only things I was looking for were replacements for things that weren't just right. To ag's point I don't think you can know in advance 100%. of the time but by analysing the things that don't work you stop making some of the same mistakes. I'm working toward a "Goldilocks" wardrobe. Not too big. Not too small. Just right! Currently, I still have too many "7" items in my wardrobe and too many placeholders. That said, I actually have a working wardrobe now --- with more than just matched outfits. I have noticed that I'm far pickier, and often leave a mall without a thing -- liking what I'm wearing far better. This top has been amazing for you -- modern and interesting, with just a touch of that retro flair. Dropping back in to say this reminded me that months ago I said I'd rather have 10 awesome outfits a season, and repeat them, than 40 mix and match versions. Must get back to working on this!! Your musings make perfect sense. You know that I love that blouse. You could wear it every day and seeing it would still be a treat. Agree with everyone that you have clarified things beautifully, while looking fantastic I might add! This is one of your best looks Shannon. And I'm taking notes on your simplicity journey. What a keen observation, that being happier with what you have means you can have less of it! It seems like it should be so obvious, right? But not always so. I have been trying to ask, about an item, " But do I want something better( " better" encompassing all meanings, not more expensive). So the pair if pants-- if I had them , will I be thinking three a better pair out there? Or do I feel great in them? ( oh, dear, pants may not be the best example).. The more refined the wardrobe, the easier it is to know what to add or not, because you've got more benchmarks and fewer benchwarmers. I was just trying to assess my own compulsion toward shopping and wonder if the same may be true of me. Thanks for getting me to dig deep and soul search at 10 pm :). Also, that blouse is beautiful. You look wonderful!